No, you still can't buy a consumer version of the amazing Oculus Rift virtual reality headset, but it's getting really, really close! Oculus just announced a brand-new prototype at the company's Oculus Connect conference in Los Angeles, and they claim it's a GIANT leap forward. While we don't have full tech specs yet, it's higher resolution, and has improved optics and 360-degree tracking—meaning unlike the last developer kit, it has tracking LEDs on the rear of the unit so you can spin around in your chair and not get sick while using it. Update: While Oculus says it's still designed to be a seated experience, the prototypes I tried were way lighter and way more comfortable than even the DK2, and it really feels fantastic to walk around a small area. I barely noticed them on my head unless or until I got tangled in the cable while walking. The resolution is noticibly better than even the Samsung Gear VR, and between that screen and the new lenses the effect is phenomenal. I still saw pixels if I looked hard, but I quickly forgot I had a screen in front of my face. That's something that I've never quite experienced with any previous VR headset. Find more impressions here. Also, for the first time, the headset has (optional) built-in headphones, which adjust in all directions for a really comfortable fit. Oculus says positional 3D audio is going to be a huge component of virtual reality from now on. "Starting today, we are working on audio as aggressively as we are on the vision side," says CEO Brendan Iribe. They're also licensing RealSpace3D audio software. "[Crescent Bay] is as massive a leap as we made from DK1 to DK2," says Iribe. 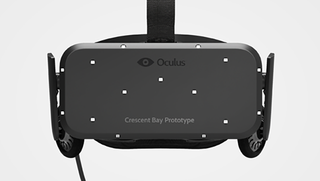 "This prototype shows the quality, the features, the presence we need to deliver consumer VR." In addition to the new hardware, Oculus spent a bit of time talking about their overall plan for VR—you know, just in case you were confused by the fact that they're now building a PC headset AND a smartphone-centric one with Samsung. The answer: pursue both! "We see these two categories continuing to converge, overlap, but not replace one another," says Iribe. "Mobile VR will continue to complement PC VR. We strongly believe it's important to lead in both to do this right." Mobile is heating up: the company plans to have VR app stores on iPhone, Android, and Windows Phone, and a specific one for Samsung's Gear VR, in addition to a web browser experience of some sort. Want to hear about what we actually saw inside the Crescent Bay? Find that right here.